Hanoi (VNA) - Deputy Prime Minister Trinh Dinh Dung and Dutch Minister of Infrastructure and Water Management Cora van Nieuwenhuizen agreed at their meeting in Hanoi on April 9 to tighten joint work to design and implement suitable policies and measures to cope with climate change. 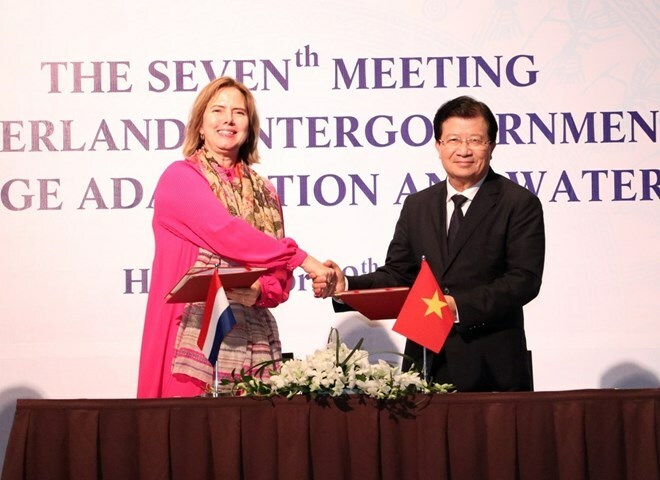 The Vietnamese Government official welcomed his guest to Vietnam, co-chairing the seventh meeting of the Vietnam-Netherlands Intergovernmental Committee on Climate Change Adaptation and Water Management. He noted that the two countries have made climate change adaptation and water management cooperation a pillar in the bilateral relations, and have gained significant outcomes in the implementation of programmes and projects in the field. Deputy PM Dung suggested the two sides continue exchanges and enhance bilateral cooperation in sustainable development fields, especially in seeking solutions to Vietnam’s biggest challenges, such as saltwater intrusion, landslides, and the effective use and management of water resources. Sharing Dung’s viewpoints, the Dutch Minister said both Vietnam and the Netherlands have to bear the brunt of climate change, particularly challenges in water resources management and climate change adaptation. According to Cora van Nieuwenhuizen, the rising sea levels, river and coastal erosion, floods and droughts, and extreme weather patterns are some of the major challenges that the two countries are encountering. In particular, the land subsidence in Vietnam’s Mekong Delta, as well as some delta regions in the Netherlands, is threatening the existence of these areas, she said. The two sides need to work together more closely to put forth proper policies and solutions, she suggested. Deputy PM Dung said Vietnam hopes to further enhance multifaceted cooperation with the Netherlands in the time ahead. The Netherlands is now the biggest European investor of Vietnam, with 327 projects worth 8.55 billion USD, he said. The country has become the second biggest European trade partner of Vietnam, after Germany, and the biggest market for Vietnamese export products. In 2018, the Netherlands imported 7.8 billion USD worth of Vietnamese goods. The Deputy PM asked the two countries to create more favourable conditions for their businesses to forge connectivity, while continuously expanding cooperation in the fields of renewable energy, high-tech agriculture, food industry, seaport, logistics services, and smart city. He suggested that the Netherlands push the EU to sign the EU-Vietnam Free Trade Agreement (EVFTA) and the Investment Protection Agreement (IPA) as soon as possible.